Post-Congress tour to Ypres and the Flanders Battleﬁelds, a full day to Passchendaele, Dixmuide, Zonnebeke, and participation at the Last Post in Ypres. Bursaries of up to 1,000 euro are available to help artists who will be under 30 on 6 September 2016 to attend the FIDEM congress in Ghent (6-10 September 2016). These bursaries have been made possible through the generosity of the University of Bergen. The bursaries will be allocated by a sub-committee of FIDEM’s Executive Committee. Applications must be received by the Secretary General by 31 January 2016 by email (secretary-general@fidem-medals.org) and must be submitted by artists through the national delegates.Applicants will be notified of FIDEM’s decision by 29 February 2016. Successful applicants will be required to attend the FIDEM congress. FIDEM will also nominate an experienced medal-maker as a mentor for each successful applicant. This mentor will advise the successful applicant on medal-making throughout 2016-17, so that he/she is in a good position to submit medals to the 2018 FIDEM exhibition. Note that acceptance of such medals for the FIDEM exhibition is at the discretion of the relevant FIDEM national Delegate. The dead-line for sending the medals which will be exhibited in Ghent in 2016 has been set to 15 November 2015. The inventory, submission and pro-forma invoice forms (word-documents) and the copyright form/formulaire droits d'auteurs (PDF's) can now be downloaded. The medals for this exhibition should not exceed 150mm in any dimension (150 x 150 x 150mm). A medal with a dimension over 100mm counts as two medals when determining national quotas. Two examples of the same medal, submitted so as to be able to show both sides, also count as two medals. All the medals should have been made within the previous 5 years and should not have been shown in an earlier FIDEM exhibition. National delegates are responsible for getting the artist and medal forms filled in by the artists and sending them to the Congress organiser. The information on these forms provides the basis for the entries in the exhibition catalogue. National Delegates should ensure that artists’ statements are a maximum of 50 words and are urged to encourage artists to focus these statements on the exhibited medals rather than on their curriculum vitae. The information should be either typed or written clearly in block capitals. National Delegates are responsible for assembling their country’s medals and delivering them to the address provided by the Congress organiser. Each country’s medals should be sent as one consignment. National delegates meet the costs of transport of the medals to the Congress organiser and insurance while in transit. The medals should be packed securely in containers indicating on the outside that they are temporary non-commercial imports for exhibition purposes only. Each container should include a list of the medal it holds. The exhibition is open to all FIDEM members, to employees of mints that are corporate members of FIDEM, and to tutors and students of educational institutions that are corporate members. Non-FIDEM members may also exhibit at the discretion of the national Delegates, but such artists are charged a fee (currently 20€ + 20€ for the catalogue), which is collected by the national Delegates and forwarded to the FIDEM Treasurer. (A member of a national medal society is not deemed to be a member of FIDEM even if that society is a corporate member.) Please note that these payments can be made via our web-shop and the dead-line has been set to 31 January 2016. 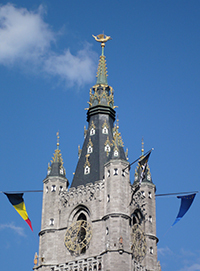 We are pleased to invite proposals for papers to be given at the XXXIV FIDEM congress, to be held in Ghent, Belgium, on 6-11 September 2016. Proposals are invited on all aspects of medallic art, both historical and contemporary. The theme of the principal sequence of papers will be: Artists and foundries / artists and mints. For over 500 years making medals has generally been a collaborative process, with artists (sculptors, painters, goldsmiths, designers and others) working with mints and foundries to make their medals. The principal sequence of papers will examine how these relationships have operated in the past and how they work today – both the challenges and the successes. Presentations on past practices are invited from art historians, whilst presentations on more recent experiences are invited from artists and representatives of currently operating mints and foundries. Papers may be given in English or French. The length of each lecture will be 20 minutes, after which there will be some time for discussion. All media presentations must be prepared using computer presentation software. No slide projectors or overhead projectors will be available. Presenters are encouraged to use Microsoft PowerPoint as their presentation media. The conference venue will provide computers and media projectors for PowerPoint presentations if required. Presenters may not use their own laptops but should bring their presentation on a USB-stick. a brief abstract of max 250 words. Please send your proposals to Paul Huybrechts at fidembelgium2016@gmail.com. The deadline for proposals is 11 March 2016. Please bear in mind that not all proposals may be accepted. It is hoped that all papers will be published in FIDEM’s journal Médailles Magazine, which will act as the Proceedings of the Congress.